Sleep – provides all-night support to the back and belly, with the contoured U-shape and deep, oversized design hugging your body comfortably, like sleeping on a soft, supportive cloud. Works for side and back sleepers alike! Relaxing – when used for resting on your back, the pillow cradles and supports the spine and hips. Reading/Watching TV – Used in an upright position, the pillow provides hip and leg support at the same time as comfortable back padding with a spot to rest your head. Nursing Support – Used upright, the pillow provides cushioning for the back and head, while providing bulk and support in your lap to rest your arms and support your baby’s body. 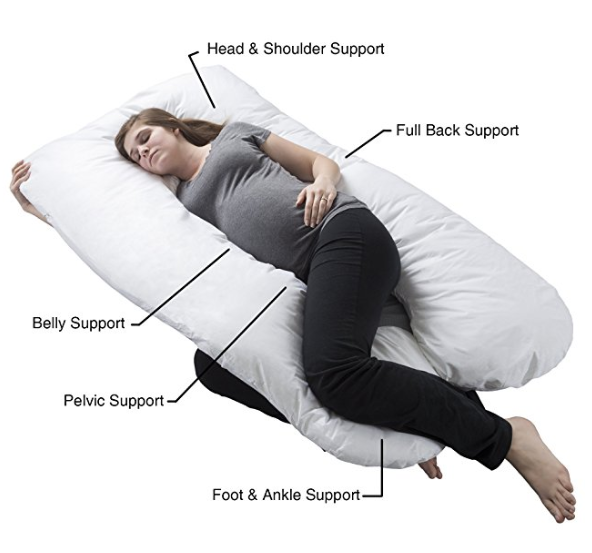 The uses of the Bluestone Pregnancy Pillow are not limited to pregnant mothers alone. The pillow also helps alleviate the pains associated with various medical conditions and helps those afflicted sleep easier and better. For sufferers of back problems, chronic pain conditions like lupus or fibromyalgia, hip, leg, or shoulder pain, acid reflux, and other conditions, this pillow allow for ideal body alignment and support, alleviating some of the symptoms of those conditions. Machine washable 100% soft cotton cover. Affordable, costing the same or less than similar pillows with more limited uses. Exceptionally tall or short users may not have ideal body positioning. Pillow is designed to be soft and supportive, but some who prefer firmer pillows may find this pillow on the softer side. In conclusion, the Bluestone Pregnancy Pillow is an affordable, high-quality support pillow for pregnant mothers and those suffering from other body-pain ailments. It provides the kind of full-body support and neutral joint alignment that allow for a restful, full night’s sleep and relief or prevention of body aches and pains.